cdogsDS_0.3_bin.7z () - Binary and data files. You may have to DLDI patch cdogsDS.nds if your loader doesn't auto patch. 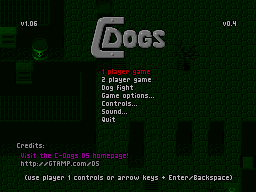 This is a port of the classic C-Dogs (cyberdogs 2) to Nintendo DS. It's a top-view gauntlet style shooter. This NDS version currently only runs at 10 FPS and has no sound, so it's not really playable yet. Copy the data folder to the root of your card. The .nds file can go anywhere. It's based on C-Dogs SDL 0.4 source but this DS version doesn't deserve the 0.4 version number. You can customize your character and select from a variety of weapons. 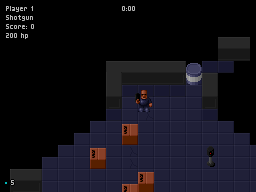 You walk/slide around, collect keys and you have to kill the weird looking enemies or destroy things and make your way to the exit. Leave the humans alone, they are just there to get in your way! cdogs SDL github - This version has been extensively updated. It doesn't include my DS changes.